The Belagavi district administration provided financial assistance and affection to 118 orphans and single parent meritorious students for their higher education. On the same lines, a Teacher of government school has come up to help five such needy girls for higher education. Shrushti Anandache secured 97.61% marks in SSLC, Shruddha Hublikar secured 93%, Manisha Sutar 92.62% and Pooja Maragale secured 90.96 % marks in SSLC and Pranjal Jadhav scored 90% marks in PUC. Teacher Satish Patil with Students. One Girl was out of town. Three among them are from rural areas and three have lost their father. Although these students are wise and aspired to get higher education, but the financial crunch in family was a big hurdle for them to get their desired higher education. 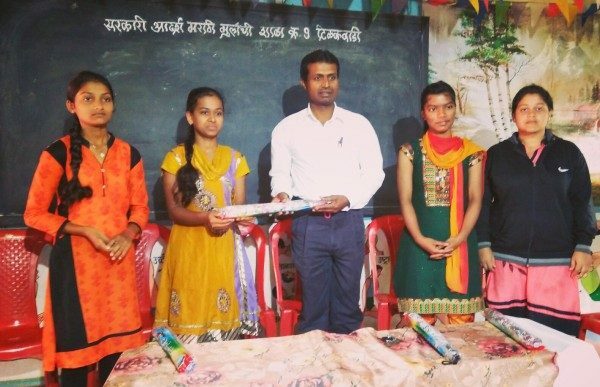 Satish Patil, incharge head master of Government Marathi school no.9 identified these five girls and with the help of donor, provided admissions to them in PU science and diploma college as per their wishes and also provided all the educational materials and necessary helps to these five girls. Teacher Satish Patil said these are meritorious student but were facing difficulties to get higher education due to their financial problems. I have just become bridge to provide help to these girls from donors. Not just meritorious students, any needy students who have special skills in sports and other activities can contact us for financial help he appealed. Good Work. God bless the students, the teacher and the donors.